And you thought the Louisville game was ridiculous. I've got to admit it's pretty nice being on the winning end of these types of games. I really don't have very many words for this other than I'm kicking myself for not being there. Lots to digest in this one. I'll start with the biggest play of the game - the steal then subsequent pass by Wanamaker. At the first replay, it really looked as if he was out, but the second one seemed to be inconclusive as you couldn't tell if his hand was off the ball when his foot was on the line. It was obviously a huge play for Pitt and to be honest, I'd have to see it again frame by frame...and even then, I might not be sure. One thing I AM sure about is that both teams did everything in their power to throw the game away. WVU gave the game away in OT by missing three free throws in the final minute then tossing the ball away, setting up Gibbs' dramatic three-pointer. 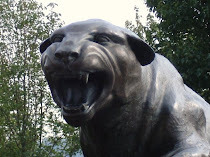 Pitt, not to be outdone, did their best 'hot potato' act when trying to hold onto a key win. 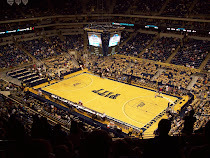 The normally reliable Gibbs then clunked one of the free throws and Pitt allowed WVU to run down the court for an NBA length three. In the second OT, Pitt really felt like they had not given WVU an equal chance and Gary McGhee fouled Dasean Butler in the act of shooting a three and he made all three to send it to a third OT. Only then did Pitt finally pull out the win. More coming soon as I gather my notes...and catch my breath.